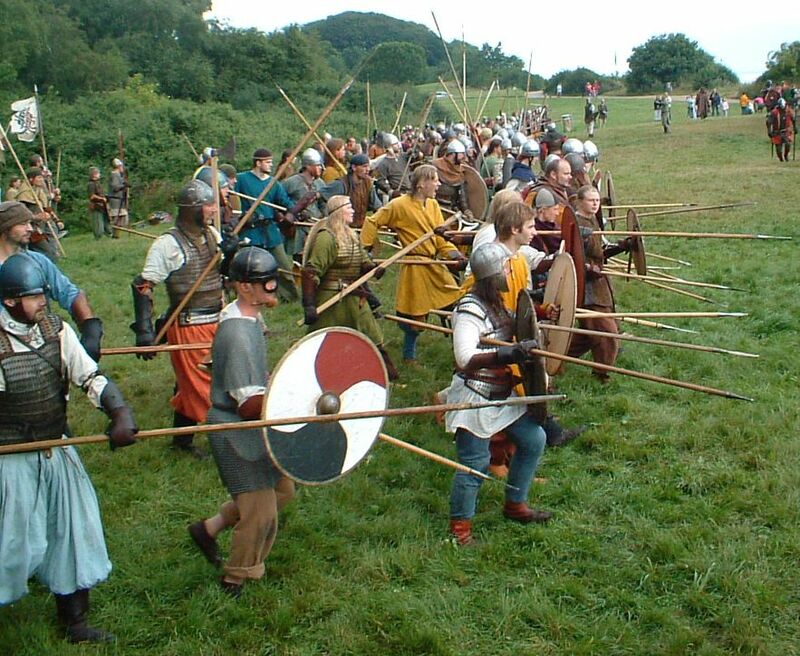 If we are discussing a Viking Age army on the battlefield then we mean how the warriors are deployed. How the individuals and groups of men stand in relation to each other. In more modern terms we are talking about ranks - men standing in line side-by-side and files - men standing in line one behind the other. Files and ranks are grouped together to make linear formations or 'lines' - much wider than deep, and columns - which are relatively deep, but still usually wider than deep. 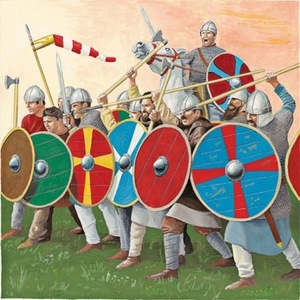 In relation to Viking Age armies in written sources and as depicted in art from the time there is only one formation adopted by men on a battlefield when opposing another army. 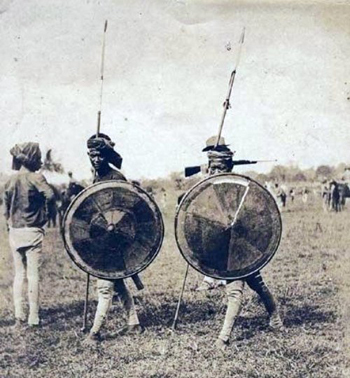 Ancient warriors used shields. Pre-gunpowder societies encountered since western societies began exploring the wider world were found still to be using them. If shield-bearing warriors stand beside each other then they give a degree of mutual protection. The simplest and oldest way of organising men to fight is the line. A deeper formation hides some men from the action, wasting their effort. The next step is make the men keep some kind of equal distance between each other and strengthen the line by making it several ranks deep. The ranks must also try and keep some regular separation from each other to avoid crowding. Zulu society c.1850 was not as complex as ancient Mesopotamia but they were spear and shield armed warriors and they fought in lines. From ancient Greece we have a lot of written evidence for organisation to fight with spear and shield. The act of taking one's place in the line of battle was an act of solidarity with other members of the state and of taking responsibility to defend one's property and the common property of the state. The basic formation was a broad line known as the φαλαγξ - phalanx. This means literally a row of logs. This is an analogy with the files of men coming into formation side-by-side to build up the battle line. The heroic poetry and prose of northern Europe at this time made great use of metaphor, analogy and simile to create memorable impact as the genre were performed for an illiterate audience. The line of shield-armed men can be readily described as a wall or hedge. In this way the usual term for a battle-line emerges - the shield wall. 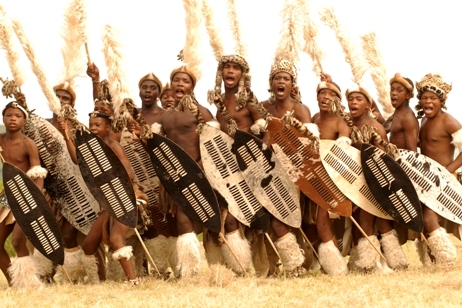 Zulu warriors: no written manuals, no instruction from foreign experts - Shaka Zulu refined traditional tactics to create an irresistable force. These men are using shields half the size of those used in Shaka's time. A linear formation of several ranks is the basis of ALL battlefield behaviour of infantry in the pre-gunpowder era. The oldest depictions of armies we have, from Mesopotamia c. 2500B.C. show this. 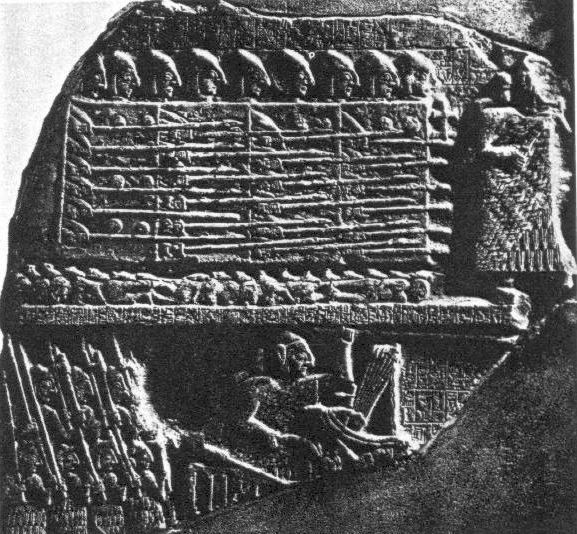 The 'Vulture Stele' shown at left shows the army of the city of Lagash. The lower scene shows men marching in an orderly manner behind the leader in his chariot. They have their spears upright. The upper scene shows the army ready to fight, with shields held facing the enemy and spears levelled. The Chigi vase. 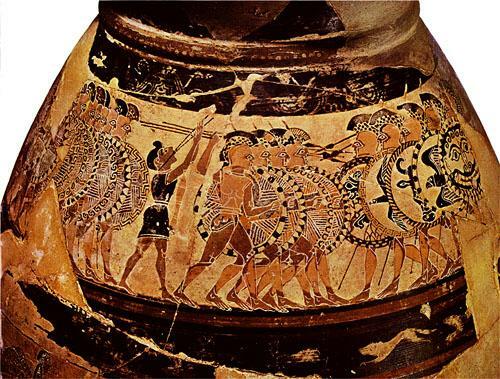 c. 650B.C.. Warriors with spear and shield face each other in phalanx formation. The situation in Viking Age northern Europe was no different. The warrior's basic equipment was a spear and shield. The shield was a broad, round Germanic-style shield. The way to get men into battle together was to form a phalanx. The ominous sight of an oncoming shield wall. The first northern warriors we have in historical texts are the Gauls. They fought the Romans until Caesar's genocidal campaigns subdued them. They fought standing shoulder-to-shoulder with shield, spear and sword. We have no Gallic accounts but Caesar tells us they sometimes fought so close that one javelin could pierce two of their shields and he calls their array a phalanx. In fighting the German army of Ariovistus the Romans had to physically break open the wall of shields presented by the warriors' phalanx. 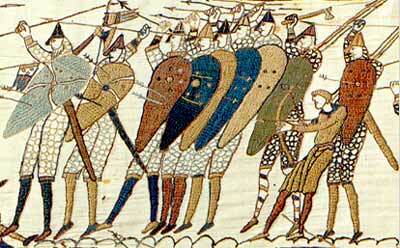 The English, with their Germanic heritage of language and fighting style were still using this phalanx formation when the Battle of Maldon was written c.1000AD. Within Old English literature there is a wealth of descriptive terms for the formation, all of which could be applied to the illustrations above. Byrhtnoth instructs his men in forming the shield wall. Gallic warriors on the Gundestrup cauldron. c.300BC. The most ferocious opponents the Romans faced were the tribes of Germans who lived on the right bank of the Rhine. The Maldon poem tells us that there was a specific way to arrange a shield wall. Which means there must have been disadvantages to making it in the wrong way. Each warrior must stand in his place and the ranks be ordered. Each warrior must hold his shield in the correct way. The stoutest warriors and the leader of the force took their place in the middle of the line. Here there was the shortest distance to each flank for aiding morale , seeing what was happening and reacting to events. The English fought a Viking army at Maldon, who took them on with the same tactic, the same formation. We have now established a path from the first group of shield-bearing warriors through to the warriors of the Viking Age in Scandinavia. We can directly examine the shield wall of Viking forces because we have depictions of them. 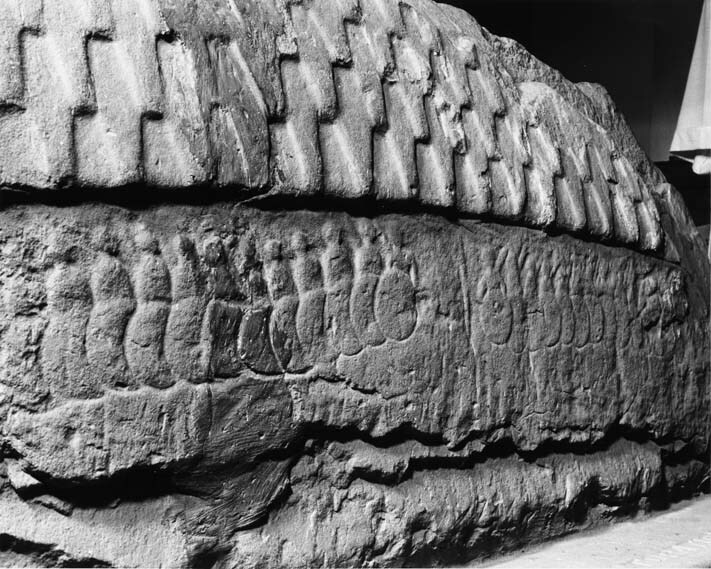 These depictions fit with the evidence we have gathered so far, that the shield wall was a phalanx. The 'Lowther Stone' is a 'hogback' gravestone from Lowther, Cumbria. It is now so worn it is hard to see what is engraved but drawings survive to show the original scene. Two lines of shields indicate one or maybe two shield walls. The ship is also decked with shields or occupied by a phalanx. The stone is dated to the tenth century. The 'Warrior Stone' is a hog-back gravestone made in Cumbria in the Viking Age. It may depict armies fighting at Ragnarok. In any case there is little doubt it shows one or two phalanx-shield walls. 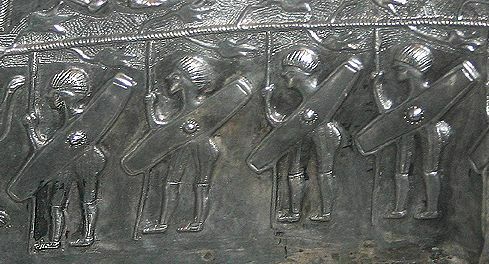 Many shields close together in an ordered line and the men are carrying spears. of a fighting force.It may be tempting to see a fulcum here with overlapping shields, but a textile is not such a flexible medium. The age of Viking activity merges into the middle ages as the barbarian north became part of Christendom. We still see the shield wall as the basic formation for infantry as long as shield and spear are the essential arms. A shield wall as depicted in the Beatus de St Sever c.1050AD. Produced in Aquitaine within the Viking Age it shows the now-usual tear-drop shaped shields. A realistic degree of wonky shield holding is included. The Bayeaux Tapestry was woven within the years of the Viking Age, c. 1075. It is a spectacular view of the warfare of the age and its comissioners and audience must have ensured it presented a realistic image. The shield may have changed but the formation is familiar.